Color: Multi green shades wavy stripe pattern. Material: 100% cotton, fabric woven in Japan. Hidden snap buttons below the collar. We will do our very best to make things right. Sleeves (Top of Shoulder to Cuff): 25". [ T E R R A T Y ] (https://stores.ebay.com/terraty) [ Donate to Earth ] (https://stores.ebay.com/terraty) [ Donate ] (https://contact.ebay.com/ws/eBayISAPI.dll?ReturnUserEmail&requested=terraty&frm=3692&iid=-1&de=off&redirect=0) [Contact Us To] (https://contact.ebay.com/ws/eBayISAPI.dll?ReturnUserEmail&requested=terraty&frm=3692&iid=-1&de=off&redirect=0) [ Men's Clothing ] (https://stores.ebay.com/terraty?_dmd=2&_nkw=men%27s) [ Women's Clothing ] (https://stores.ebay.com/terraty?_dmd=2&_nkw=women%27s) [ Kid's Clothing ] (https://stores.ebay.com/terraty/Kids-Clothing-/_i.html?_fsub=58063841013) [ Clearance ] (https://stores.ebay.com/terraty/Clearance-/_i. Jhane Barnes JBH Multi Color Print Button LS Shirt Sz XL MINT!! Note that there may be color shade and hue variances due to different monitors and device settings. Pit to pit - 25”. Width at bottom - 25”. Shoulder to cuff - 25”. Sales are final. Sleeve length (shoulder seam to cuff) 24". Weight 9 oz. Blue, Green, Tan Dress Shirt, Geometric design, this is in excellent condition, dry cleaned, no flaws!! A beautiful shirt that goes with any season. If you know JHane Barnes, your getting a great piece of clothing! Pit to pit: 25". Color: Purple White Gray. Top to bottom: 31". Jhane Barnes Men's Polo 3 Button Shirt Multi-Color Abstract sz XL 100% COTTON ! · At least give us the opportunity to adjust the problems. #2 Chest/Bust 23" Pit to Pit exterior. #4 Sleeve 9" Shoulder seam to end of cuff. Color : MULTICOLOR. Shirt is in excellent condition with the exception of two small spots, one on the left shoulder and one on the right sleeve. See last two photos. Price reflects these imperfections. Back collar to bottom - 28”. Professionally dry clean. 100% Cotton. Excellent condition. chest (underarm to underarm): 26" across. · At least give us the opportunity to adjust the problems. #4 Sleeve 10" Shoulder seam to end of cuff. Color : MULTICOLOR. A very unique fine shirt in excellent pre-owned condition. Shirt Length (Neckline Seam-Bottom): Approx. 31.5 " Front / Approx. 32.5" Back. Material: 100% Cotton. No local pick up is available. Hidden Button Down Collar. SIZE XL//TG IN 100% COTTON. LONG SLEEVES - FRONT BUTTON- ONE FRONT POCKET. Shoulder to shoulder: 22". Matched chest pocket, fabric woven in Japan. In excellent condition. Sleeves: 22". Sleeve length (shoulder seam to cuff) na". Chest (armpit to armpit) 26". Jhane Barnes XL NWOT purple Classic Fit L.S. Jhane Barnes XL NWOT in a richly textured purple/blue/magenta Classic fit with black over stitch in a geo pattern. Fabric: 100% Cotton. Width (Pit to Pit): 26". Other Condition Notes: We are excited to share this with you. Overall This Piece will do you proud, and you're gonna love it! We try to be very thorough during inspection to make sure you know exactly what you're getting. 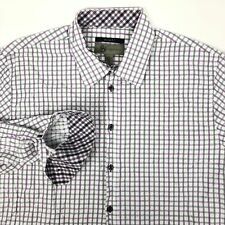 This listing is for a Jhane Barnes men's long sleeve button-front shirt with a pocket. It is a size extra large. It has 28 1/2 inches width across the chest, 22 inches between the shoulder seams, 32 inch length, 25 inches from the edge of the sleeve to the shoulder seam and 37 inch sleeves. It appears to be in mint condition. The material is 100% cotton. Returns are accepted. Bottom of collar to bottom of shirt: 32.5. Armpit to Armpit: 26. Shoulder seam to end of cuff: 23.5. Very good pre-owned condition. JHANES BARNES shirt is in excellent shape. Shirt is a XL Button front. Measurements across the front from underarm to underarm 27” and the length of the shirt from shoulder to hem measures 33” and the length of sleeve from neckline to bottom of sleeve measures 32”. No holes no rips no stains. Sleeve: 24". Chest: 27". Material: 100% Cotton. Total Length: 31 1/2". Condition: Excellent. JHANE BARNES. 24" pit to pit, flat. 22" pit to cuff, flat. 30" collar to tail, flat. Shoulder to shoulder: 23". pit to pit: 27". Pit to Pit 27.5" / Length From Bottom of Back Collar 31.25". Long Sleeve Button Front (Hidden Button Snap Under Collar) Shirts. Material: 100% Cotton. Lot of Two (2). JHANE BARNES. 24" pit to pit, flat. 22" pit to cuff, flat. Front Dress Shirt. 30" collar to tail, flat. Length ( Top of Collar to Hem ): 29.5. Width Pit to Pit (Across Chest ): 24. Length ( Top of Collar to Hem ): 31.5. Sleeves (Shoulder seam to Cuff ): 27. Sleeve (shoulder to cuff): 10". Length (collar to shirt bottom): 32". This item is used, therefore the actual size may differ from the advertised size. Material : 100% Cotton. Chest (pit to pit): 23". FABRIC WOVEN IN JAPAN. SIZE XL SLEEVE 35.5" SHOULDER 20.5" CHEST 25.5" LENGTH 34.5". Pit to Pit 24". Top to bottom 32". STYLE:­Short sleeve polo-style shirt. LISTED SIZE:XL. REGION OF MANUFACTURE:Turkey. Size listed is based on item’s label. Fit may vary by manufacturer and style. MATERIAL:100% cotton. In excellent condition! 100 % Cotton. For sale is a shirt from Jhane Barnes in 100% Cotton, featuring a "hidden" snap button-down collar, 1 front breast pocket design. Item: #S8D24E102918A2. A very unique fine shirt in excellent pre-owned condition. Shirt Length (Neckline-Bottom): Approx. 30.5 " Front / Approx. No local pick up available. Material: 100% Cotton.